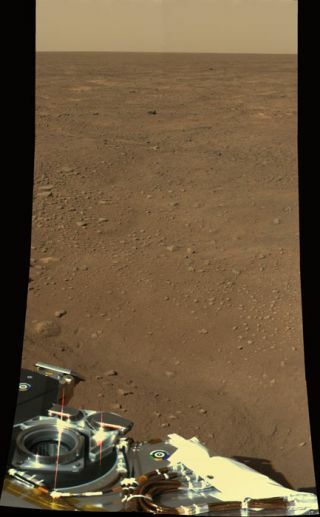 This approximate color of Mars view was obtained on sol 2, May 27, 2008, by the Surface Stereo Imager (SSI) on board the Phoenix lander. The view is toward the northwest, showing polygonal terrain near the lander and out to the horizon. PASADENA, Calif. — NASA?s Phoenix Mars Lander is set to flex its robotic digging arm for the firsttime after a one-day delay due to a communications glitch, mission scientistssaid Wednesday. Commands to deploy Phoenix?sscoop-tipped robotic arm were uploaded to the probe today, even as scientists poredover the newest images of the spacecraft?s Martian arctic landing site. The newimages were beamed to Earth Tuesday evening after the Mars ReconnaissanceOrbiter (MRO) switchedoff its radio antenna earlier the same day for a still unknown reason. Despite thecommunication glitch though, Phoenix is doing just fine, mission scientistssaid at a press briefing. ?The spacecraft is inexcellent health, absolutely excellent health,? said Phoenix project managerBarry Goldstein of NASA?s Jet Propulsion Laboratory (JPL). The craft landed in VastitasBorealis plains of Mars on Sunday evening to begin its $420-million mission todig into the rock-hard layers of water ice beneath the Martian soil of theplanet?s arctic region. It is designed to test the soil and ice for signs thatthe water was once liquid, and to see if it could have created a habitablezone for microbial life at some point in the past. Mission controllerssent Phoenix its first instructions to move its robotic arm this morning. They planto unstow the arm in stages over the next two days. The arm contains fourjoints: a ?shoulder? joint that can move the entire arm up and down and fromside to side, an ?elbow? joint that also moves up and down and a ?wrist? jointthat moves the scoop on the end of the robotic arm. The first step ofunstowing the arm, expected to occur this afternoon, involves moving the scooptowards the arm with the wrist joint, which will release a spring-loaded pinthat kept the arm restrained during Phoenix?s August launch and Sunday landing,Goldstein said. While it seems like aminor movement, ?it?s actually a very critical activity,? said Robert Bonitz,the Phoenix robotic arm manger at JPL. Mission scientistshope to receive images of the arm?s initial movements during theirdownlink with NASA?s Mars Odyssey orbiter late tonight. Because of the MRO antennaglitch, mission controllers are now using Odyssey to communicate with thelander indefinitely. Scientists had planned to use both orbiters throughout themission, depending on which had a better communication angle during aparticular orbit. ?This is a contingencythat we?ve always planned for,? Goldstein said.? ?As it stands, we?re in fineshape.? Goldstein said that diggingwith the robotic arm is unlikely to start before early next week and thatthe team is working slowly to make sure each stage is done correctly. ?If [digging] doesn?tget done in the early part of next week, please be patient with us, we aregoing to do it,? Goldstein said. Phoenix sent moreimages of the surrounding Martian terrain on Wednesday morning, including acolor image that it took as part of a back-up command sequence it used when itfailed to receive instructions from MRO on Tuesday morning. The image adds to the360-degree panorama scientists are building from the snapshots taken by Phoenix?sstereo camera. They expect a low-resolution, black-and-white panorama to becompleted today, with a higher-resolution, color panorama being completed in afew weeks. NASA's next Phoenix mission briefing will be broadcast liveon NASA TV at 2:00 p.m. EDT (1600 GMT) on Thursday, May 29. Clickhere for SPACE.com's Phoenix mission coverage anda linkto NASA TV.